Aenfor Desktop Cell Phone Stand Tablet Stand, Playstand for Nintendo Switch Multi-Angle Cradle, Holder Dock, Phone Stand for all Android Smartphone, iPhone x 8 7 plus 6 6s plus 5 5s 5c,5e, Google and Moto. Just let your hands free and enjoy a video and playing games!!! It is the most conveniently adjusts between different viewing angles, ensuring you're able to get just the right viewing angle and makes charging simpler and won't bend your cord. It is the small desktop display touch stand especially designed for iPad and iPhone models all versions. Occupy little space, it must be the most great cool desk accessories. 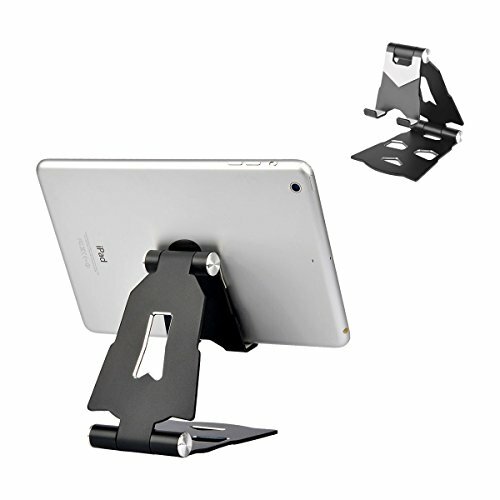 This tablet stand is made of premium Aluminum Alloy, with smooth edge and matte surface. The elegant sliver finish compliments most devices (especially for iPad), both in color and style. It is pretty stable on the tabletop. It's convenient to cook meals when you learn cooking through video recipe teaching, without worrying about soiling the big iPad or cell phone. The hook of this cell phone stand is longer than others so that it could hold your device even with a heavy case on. Get an Aenfor tablet phone stand just now, make your life different! Hands-free & Good-looking: This phone stand free your hands while watching video, playing games, listening to music, making a phone call, viewing recipes, using Facetime and Youtube. It looks very stylish and sleek, which is a perfect accessory for your desk / nightstand while at home & traveling. Adjustable & Portable: While reading, adjust the device up or down for most comfortable height or angle. Allows you to play and charge simultaneously. It's very portable and can be fully folded to pocket-size which will save you plenty of space and make it easy to carry anywhere. Solid & Protective: Stand for Nintendo Switch can be easily change the position and it stays firmly in place. Made of high quality premium aluminum, it's very sturdy and stable to use. The rubber pads can protect your phone from any scratches and slide. Wide compatibility: Tablet phone stand Works for to 4-13 inch Tablet PC phone such as iPhone 6 6S 7/7/8/8 Plus X，Galaxy S9/S8 / S7 / S6 / Note 5，LG，Sony，Moto, Google Nexus，Nintendo Switch, Samsung Tab，Kindle，Fire, iPad mini / pro / Air / Air 2/Air 3/Air 4, Aenfor offers life time warranty for all its products. If you have any questions about this product by Aenfor, contact us by completing and submitting the form below. If you are looking for a specif part number, please include it with your message.